I picked up a 2010 NT pajero in November of last year and have been progressing with the mods as I go. I don't have a lot of 4wd experience save regular trips up the watagans but mainly trail roads rather than tracks. My previous vehicle, the delica opened my eyes to 4wheeling and I plan on doing lots more and getting a bit more adventurous with it. It's still my daily, so it has to make it home. That said, a lot of my mods are to make sure it gets me home and to work on Mondays. Of course other mods are just because I wanted to. here she is the day after picking it up. bog standard. With my little buddy co-pilot riding shot gun. harder for him to see out of this than the deli. Whilst I do own a caravan and enjoy that, when it comes to camping, I like nothing more than finding a some quiet out of the way spot that no body goes to and spend a few nights there on my own with the dog. As much as I loved the deli, the Paj should get me to a few more of those places. I like to shoot videos for youtube, as I find it super useful when I'm trying to tackle a new job and can watch someone else do it first. To that end, a lot of my stuff is the processes I go through to mod the Paj and checking out the things I've added to it. I hope these might be of help to someone looking to do the same. I'll add a heap of vids first up and will be sure to update when I do a new one. I'd love any feedback and comments along the way. custom nudge bar platform build for lights and antenna. This will go soon with the arrival of the bullbar. DIY rear antenna mount. not my best work but more proof of concept. Again, this will be reviewed once the bar arrives. this is the install of a deep cycle battery in the 3rd row seat space. Still a work in progress as I'm currently working on a box/bed install for camping which will involve a switch board and permanent compressor set up. This was wiring it up and running the solar from the roof. I love my foxwing awning after coming from one of those standard jobbies. I think you can tell how happy I am about it from the vid. probably only of interest for those with the Pajero. This is how to get the dash apart. 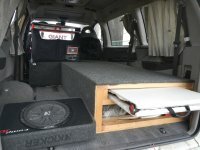 over the past few weekends I've been sticking some time into building up the storage /bed platform for the rear of the NT pajero. but in an effort to reduce weights, I decided to give the connect it a go for the frame. I checked out the prices at bunnings but found capral aluminium to have the same product but at about half the price. They call it qubelok though in case you go searching. The timber is 12mm ply, most of it salvaged from the previous delica build. I was going to give those away after the delica sold. Bloody glad I didn't. The marine carpet is expensive. The frame basically becomes a bed platform with the addition of a smaller box at the end. This is so during normal use, the smaller box stays out and I still have access to the storage well at the back. The additional box will be used to house some camping gear and will only be put in when I'm camping from the car. I do love the ability and security of climbing over the back and sleeping inside the car. Its perfect for those quick over nighters. All I need to do is grab some snacks and some fire wood and I'm away. When I'm done, chuck the chair back in the box, pack up the dog and I'm gone. It's still a work in progress and I need to figure how to mount it to the floor so it doesn't move. It's pretty well in there now but I'd be more comfortable bolting in down just in case. Should be an easy enough job to do. Here's the video giving you the guided tour thus far. I picked up a set of the diff breathers from AOB last week and got a chance to do the install today. It's an easy job and the longest bit is running the breather hose from the rear up to the engine bay. I found the rear breather is only a press fit, so the threaded adapters that come with the kit were useless. Not super happy about this tbh. Happy to be corrected here. So I ended up just reusing the rear connection for the hose as is. Like others, I just extended the front one up from under the air box to the same spot. my soon to be fitted arb commercial bar has arrived and I'm a tad excited. I was planning on picking it up in the back of the paj (only front seats) but a mate said it was never going to happen. He was right. Damn it !! seriously more box that is needed I think. Had I unpacked it, I think I could have gotten away with it. I had 1800 to play with, it was 2000. so close, but no cigar. Anyway. here is the usual vid giving you a look at whats in the box and a bit of a surprise for me regarding weight. If you plan on watching the video, post up a weight that you think the bar is before watching it. I am curious what others think they weigh out of the box. For what it's worth, there does not seem to be any definitive info on the net and dealers will not provide a weight...so I'm told. Net weights suggest anywhere from around 40kg to 80kg. So, I can't find an exact weight but in the video, I lift the bar with one hand. So I would say this is somewhere around or even under 30kg for just the bare bar. Add the brackets etc and it will obviously be more. Here she is. I shot lots of footage of the install and took lots of pics. It will take a while but I'll throw up the install vid soon enough. If anyone is looking to do the same, more than happy to answer questions or post specific pics if I have them. Pretty happy with the final result. First bullbar install and all. Not sure how exciting the video will be if you're not looking to do one yourself. I have been following this thread as my challenger is stock, it's giving me good info on things I can do or give to the work shop to do. excellent. I hope it helps you get into it. Most things are easier than you think. Plus its a good excuse to buy some new tools . As per above, here is a series of 3 videos which cover the install of the ARB bar onto the front of the old Paj. Installing a bullbar was not something I had done before and cutting into the pajero was not something I was taking lightly. Whilst it took longer than expected, I'm very happy with the results. There were a few stages that had me pausing and thinking but at each of those steps I managed to make it through. Those moments can cause the pucker to tighten up though. Of course everything relaxes when you figure out a plan. It's pretty labour intensive and I don't think I would tackle this in a single day. It's more a weekend job. A long weekend would be even better to take your time. Instructions were a bit of a mix from good to rubbish. There are not enough pics to guide you and to give you confidence that you have it right before moving in for the kill. Lots of image searching on the net was of some assistance. I tried to cover all the bits that I had questions about in my head when considering going ahead with a self install. 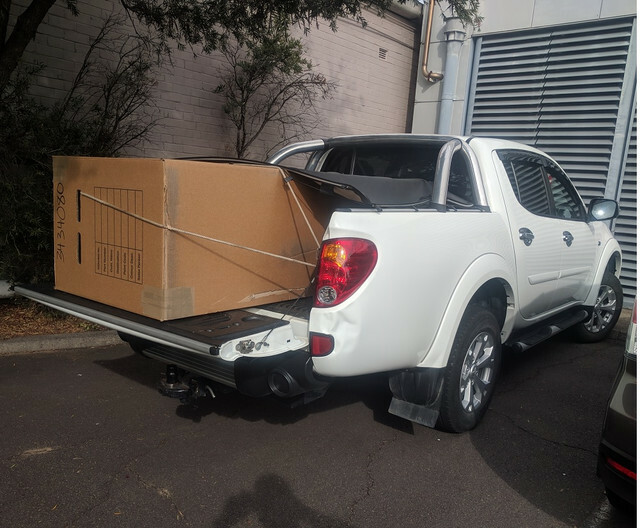 A mate said he would have happily paid the $400 odd for it to be installed. .....but where is the fun in that. It's not every day you take to your truck with a jigsaw and grinder. Oh and get some mates over to help with the lifting etc. figure I may as well keep it all in the same spot. I was going to ask if you could post up some footage for that.